The Ottomans defeating a multinational Crusader Army during the 1396 Battle of Nicopolis in modern Bulgaria. The battles of the Crusades were part of a series of religious wars that were initiated by the Roman Catholic Pope between the 11th and the 15th Centuries. The wars were against the external and internal enemies of the Christian with an indulgence promised to those who were bold enough to take part in the war. The Crusade wars were fought for several reasons including recapturing the Christian territories, resolving conflicts among rival groups within the Roman Catholic, capturing Jerusalem, defending Christians in the non-Christian territories, and combating heresy and paganism. The battle of the crusade was mainly between the Muslims and Christians who fought all over the Holy Land and the Mediterranean for control and dominance. Some of the most significant battles of the Crusades are looked at below. The Battle of Aintab was fought in August of 1150, and was led by the King of Jerusalem, King Baldwin III, to repel the attacks by Nur ad-din Zangi of Aleppo. During the fight, several Latin Christians who were living in the County of Edessa were evacuated as a part of the King’s strategy to win the war. Nur ad-din Zangi’s Turks attacked the crusaders with showers of arrows to break their formation. However, the Crusaders who were highly organized managed to protect the refugees and the baggage train and resisted the Turks’ attack. The Turks soon ran out of supplies and had to withdraw at sunset enabling the crusaders to deliver the refugees to Antiochene territories. Though the territory of the County of Edessa fell to the Turks, Baldwin the King managed to protect the pro-Latin civilians. The Battle of al-Babein occurred in the Third Crusaders' Invasion of Egypt on March 18, 1167. The King of Jerusalem, Amalric I, and the Zengid army both wanted to take control of Egypt. Amalric I wanted to chase Muslims and Shirkuh out of Egypt. However, on reaching the Valley of the Nile, the Muslims turned against Amalric’s army having been weakened by the steep slopes and soft sand. Shirkuh who was commanding the Muslims managed to break the battle into smaller skirmishes with both the Turks and the Franks winning some of the skirmishes. Without any clear victor between Amalric and Shirkuh, King Amalric I failed to become the ruler of Egypt. The Battle of Adramyttium broke out on March 19, 1205, and was fought between the Latin Crusaders and the Byzantine Greek Empire of Nicaea. There are two accounts of the Battle of Adramyttium. 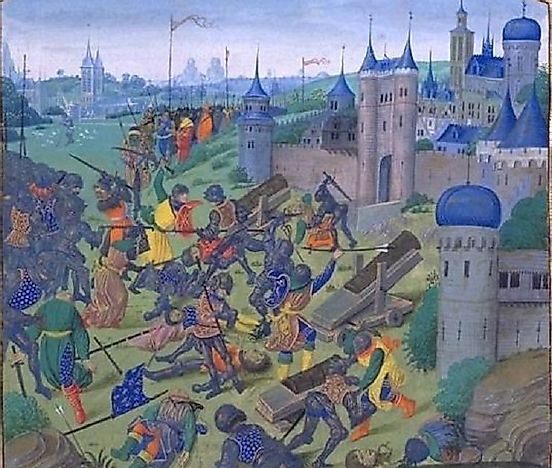 The first account by Geoffrey de Villehardouin suggests that Henry of Flanders occupied the city of Adramyttium and used it as a base to attack Byzantines. Constantine responded by raiding the city of Adramyttium where Henry was. The battle broke out between the two camps with the Franks killing and capturing much of the Byzantine Army. The second account is by Nicetas Choniates suggested that it was Theodore Mangaphas and not Constantine who led the Byzantine Army against Henry in the Battle of Adramyttium. However, Choniates agrees that it was the Franks who won the battle killing a large number of the Byzantines Army in the process. Historians have tried to reconcile the two accounts by suggesting that there must have been two separate attempts to drive Henry out of Adramyttium, first by Constantine then Mangaphas within a short time in 1205 both of which failed.